The 11th edition of the Michelin Challenge Bibendum was held from May 18th to 22nd at the Berlin Tempelhof Airport. On this occasion, the Venturi Volage has won the Design Award. Fitted with "Michelin Active Wheels", the very architecture of the vehicle has been completely reconfigured by designer Sacha Lakic : "Active suspension and engines incorporated into the wheels, flat bottom, aerodynamic tunnels : these choices and technological advances have allowed me to "design the void" usually occupied by the engine and suspensions, and thus explore bold new styling possibilities." 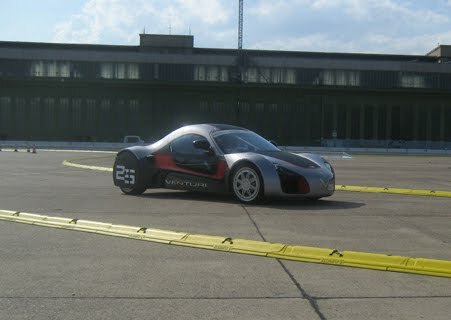 The Venturi also participated in the “Battery Electric Vehicles” Rally held on May 17th and 18th. Volage won the Best Acceleration Prize (0 to 50 km/hr in 2.2 seconds) and the CO2 Emissions Prize. With 4-wheel drive and active suspension, the Venturi Volage has no equivalent. "Active Wheel" technology in fact incorporates 2 electric motors per wheel (1 for suspension and 1 for drive), ie. a total of 8 electric motors driven in real time by sophisticated electronics. The active electric shock absorber system allows for total adaptation to road surface and driving types. Thanks to its road holding, manoeuverability and silent running, the Venturi Volage represents the ultimate in present-day automotive technology.